Its director-general Datuk Prof Dr Azizan Baharuddin said the country needed highly skilled manpower and Malaysia should create its own guidelines and not to follow the guide from the west. “Many people have misunderstood and the community can change this attitude and value through religion and as such we should not follow the west. 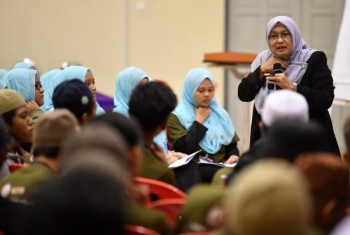 Under the principles of Maqasid Syariah (foundational goals) to seek success in the world, we have to balance between knowledge of the al-Quran and Hadis as guidelines,” she told Bernama at an Al Islam Programme at Mara Higher Skills College (KKTM) here last night. About 150 students from KKTM, Mara-Japan Industry Institute (MJII) and Mara Skills Institute (IKM) from all over the country are attending the four-day programme which began on Nov 16. The programme combines training modules suitable for the daily life of youths who are dynamic, practical and professional. Azizan said the programme was aimed at assembling students from KKTM, MJII and IKM in a knowledge discourse to develop human capital based on the concept of Islamic and spiritual movement. Apart from that, the programme is also to improve the practice of compliance and faithfulness to Allah in one’s life. “Strengthening one’s faith through prayers and upholding high moral among students would guide them towards the spirit of true Islamic brotherhood,” she said.